Home » Somalia: MAP Applauds the Newly Elected Somali President & Demands For Genuine Accountability, Protections for the Somalia’s Journalists. GAROWE, February 10, 2017: The Media Association of Puntland (MAP), wishes to congratulate the newly elected Somali president Mohamed Abdullahi “Farmajo”. Incumbent President Hassan Sheikh Mohamud held a slight lead over Farmajo after an initial round of voting Wednesday 8th, that included a field of 21 candidates. Mr Mohamed obtained 184 votes, compared with 97 for the outgoing president, who accepted defeat, avoiding a third and final vote. ‘’On behalf of the Media Association of Puntland (MAP) I would like to extend congratulations on your impressive victory in election to the seat of the Somali President. I am delighted that you will continue to work for the good of the people of our country, May the almighty Allah (SWC) guide you and your administration in driving our country out of the problems and give us safe and prosperous Somalia’’ said MAP’s chair in his statement congratulating the new Somali president. The new president will have to deal with multiple challenges: the threat posed by extremist groups in Somalia, Impunity on crimes against journalists by state and non-state actors, a looming famine, weak institutions, feuding factions and rampant unemployment in a country where a majority of the population are under the age of 30. Despite the fact that MAP best wishes to Mr. Mohamed Abdullahi Farmajo in his tenure and the challenging endeavors as the Somali President, the Association is deeply concerned by all human rights violations and abuses committed in relation to the safety of the Somali journalists and media workers, including killing, torture, arbitrary arrest and arbitrary detention, expulsion, intimidation, harassment, threats and acts of other forms of violence in the past years yet none of the 21-Somali Presidential candidates in the race including the successful candidate ensured in their agenda, campaigns and nor did they even condemn the crimes committed against Journalists in Somalia. Journalism is one of the riskiest professions in Somalia. The country has consistently been rated one of the most dangerous places in the world for journalists. The Somali media remains challenged by censorship, intimidation, harassment, unlawful detention, imprisonment and mysterious assassinations bearing the hallmarks of extremism and political instigation. Many journalists, reporters and other media staff fled to neighboring countries leaving the sector with considerable human resource challenges. These high personal risks discontinued experienced journalists from active practice in Somalia. The sector attracts, only, low skilled labor due to the low wages and the dangerous repercussions. The Media Association of Puntland, MAP, calls on Somalia’s new President to take measures to facilitate the work of journalists, including measures designed to protect those in imminent danger. The primary aim of guaranteeing the safety of journalists, and striving to combat impunity of the perpetrators of crimes committed against journalists, are both essential to preserving the fundamental right to freedom of expression, ensured by Article 19 of the Universal Declaration of Human Rights, as well to promote democracy. MAP recognizes and echoes to the newly elected Somali president that comprehensively ensuring journalists’ safety requires dismantling legal apparatuses of censorship, entailing the repeal of criminal insult and defamation laws, in particular where they give heightened protections to public figures, the criminalization of “extremism”, provisions on “disseminating false news”, as well as prohibitions on profanity and treason. 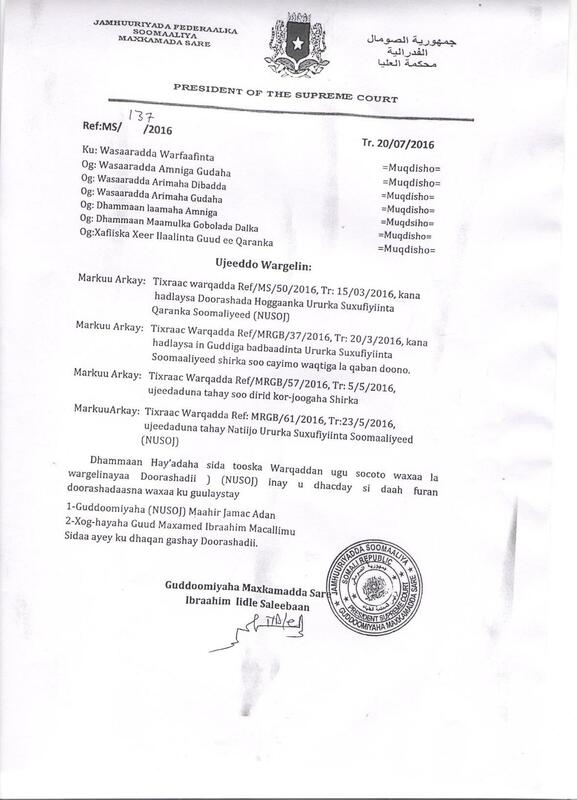 On the legal front, the Media Association of Puntland alerts the new administration on the need to review the Somali Media Bill that became law in January 2016. This law guarantees certain freedoms, including the independence of public broadcasting, protects the right to information for journalists, and prohibits censorship or forced reporting on issues contrary to public interest. It also lists prohibitions of what can be reported on, including broadcasting false reports, inciting hostilities, encouraging clannism, and disseminating baseless propaganda. However, some terms used are unclear, which allow for subjective interpretation leading to undue restrictions or limitations on the right to freedom of expression. These terms include “disseminating false news”, “inciting violence”, and “defamation of persons or institutions”. These restrictions provided by the Media Law lack the precision necessary to enable citizens to regulate their conduct accordingly, which is inconsistent with international law. Furthermore, the Media Law provides for high penalties and fines for journalists and media outlets for such violations. In addition, the Ministry of Information has a wide margin of discretion in controlling the registration of journalists. representatives in the Council within three days, leaving little time for consultation. The Media Association of Puntland, MAP, brings a vital concern to the attention of the incoming administration in stopping the vicious activity international federation of Journalists (IFJ) has continuously carried out in Somalia. IFJ’s operation in Somalia through ‘’a known fraud legend’’ has been major setback to the growth of the media in Somalia and has created nothing rather than blocking International donors from contributing to development of the media in the beleaguered country. The IFJ’s continuous support and disrespect to the Supreme court notary is a true description of an actor taking advantage of our government’s weak institutional capacity and the fragility state of Somalia. MAP and other several Somali media groups active across Somalia have sent emails to the top-officials of the IFJ-secretariat including the current IFJ president Philippe Leruth, while demonstrating to the officials on how their support is disrupting wellbeing of the somalia media fraternity but the respond from the IFJ officials has been silence. ▪ Prioritize the implementation of the recommendations of the UPR related to freedom of expression and the media, protection of journalists, prosecution of perpetrators of violations against the media workers and political actors. Some of these recommendations have been considered in the action plan on the Human Rights Road map 2015-2016. ▪ Ensure investigation and prosecution of individuals responsible for attacks against the media and media workers, including law enforcement agents whose code of conduct should include proper treatment of media professionals. ▪ Hold accountable and stop entities such as International federation of Journalists (IFJ) in supporting illegal channels while undermining the Somali Supreme court notary and legal orders. The Committee to Project Journalists’ 2016 Global Impunity Index which spotlights countries where journalists are slain and the killers go free has for the second-straight year ranked Somalia as the worst country in the index. 57 journalists were killed in Somalia since 1992, 39 out of the 59 were killed in the last 8 years. In 2016 alone, two journalists have been killed.